Suppose you have large content (e.g. 3000 pages) in your EPiServer CMS project, supporting multiple languages e.g. English (en), French (fr) and Italian (it). Pages might be created using different page types. You want to delete a language branch e.g. French (fr) from all pages where it’s used and from the website. You don’t know exactly how many pages use French (fr) language. I upgraded a client's DotNetNuke version to DotNetNuke 5.1 to 5.6.3. The DNN Portal which was running DotNetNuke Version 5.6.3, while I was working on it, all of a sudden the filemanager stopped working properly "Spinner in the Root TreeView". Same problem was with the modules "Action" menu. It was a mess to do anything on the website in edit mode. In your module, if you need to access to the SMTP settings specified in the HOST settings of the DNN portal, you can use the following function to retrieve it and use it in your code. This post is from my old blog posted on February 2011, that unfortunately no longer exist. You can use the following functions to convert a Decimal Monetary value according to specified culture.And Revert it back to decimal. As you already know while reading this post Netflix offers different content to its users depending on where the user is accessing the service from. Like they say "Everything’s bigger in the US", and so is the amount of films and TV shows on Netflix. It is natural for users this side of the pond to want to access content that is so close, and yet so far. I live in Sweden and Netflix content here is very limited. It annoys me so much as I pay the same fee as US or UK users and get far less content. So I was looking for some cheap, kind of legal solution to access US Netflix content and voila I found rather two free solutions to fool Netflix and get what I desire. The result is thousands of new TV shows and movies. The Methods I am going go share here use same trick called Location Spoofing, in other words faking your location. It lets Netflix think that you are in the US but you are actually not, hence more content for you. As I mentioned earlier, the "kind of legal" way well is a grey area. If you’re planning to fake your location in order to access products and services that aren't available in your own country then be warned: this is morally questionable area and there may be consequences. So If you don’t care and want to keep going on well let’s start with the reason you are here in first place. Now, here's how you access US Netflix outside the US. Go to hola.org and click on the big blue “Start using Hola, it’s free” button. Or find free Hola browser extension from Chrome or Firefox and install it. 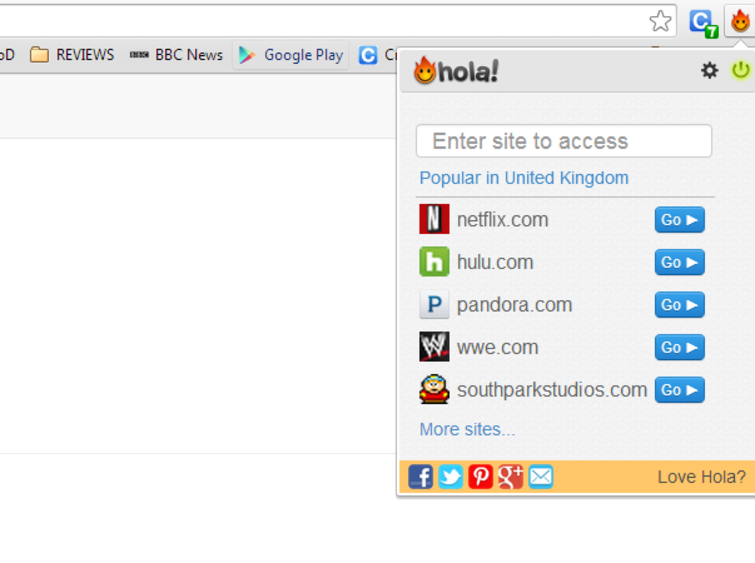 Now that Hola is installed on your browser, you simply need to click on the icon and select the Netflix shortcut. Or go to Netflix in your browser, Hola will ask you what country you want to pretend to be in, Select US and halleluiah get lost in the thousands of new TV shows and movies the people across the pond have. Note for Android folks: You can install Hola from Google Play store, giving any Android device access to the US Netflix library. CyberGhost is in bigger picture is same as Hola. Instead it’s a desktop based application method rather than browser based. 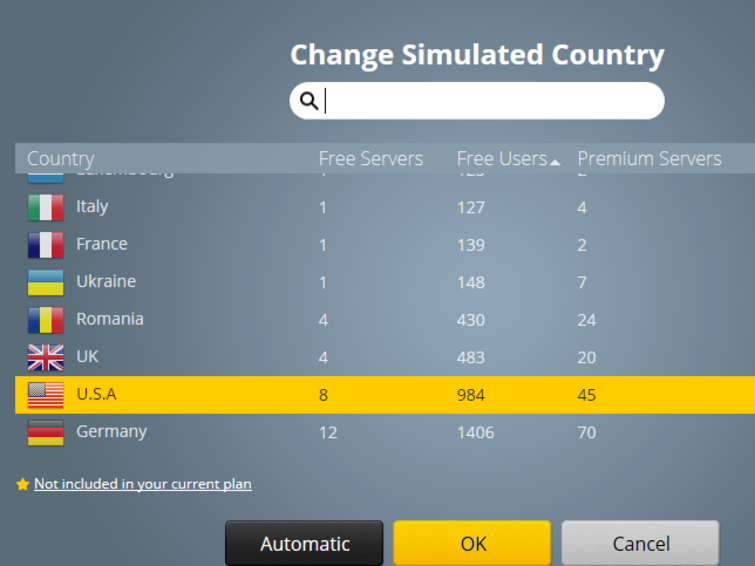 Open CyberGhost, click on the Simulated Country dropdown box and select "USA" from the list. Next, press the yellow power button located in the center of the window. Now you are connected to a server located in your desired country. Open a browser window, go to Netflix in your browser and you will appear to be surfing from a spoofed location.